The Zelkova Tree is a large shade tree that is increasingly being planted to replace the lost elms of America. It is disease-resistant, hardy, and adaptable to different conditions. It grows rapidly when young so it will soon become a mature tree. 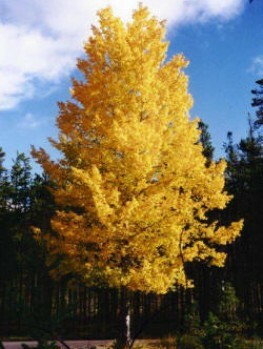 It forms a large, spreading tree with beautiful leaf-colors of red, orange and yellow in fall. This beautiful tree is an excellent choice for a trouble-free shade tree across a large part of the country. Once upon a time in America, the streets were lined with rows of majestic Elm trees, casting their shade and bringing grandeur to the smallest town. These trees are no longer with us. Dutch Elm Disease destroyed almost all of them and despite attempts to breed disease-resistant varieties, it doesn’t look like they are coming back soon. However that doesn’t mean that majestic trees are gone. The Zelkova tree is a cousin of the Elm and is resistant to that deadly disease. 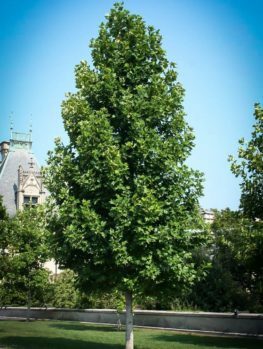 Just like the Elm, it too makes a majestic shade tree that will grace your yard with its natural beauty. The Zelkova Tree (Zelkova serrrata) is native to Japan, Korea, Taiwan and eastern China. It has been cultivated there for centuries where the wood is used for furniture and drums. It is now a major street tree in New York City, because of its hardiness and trouble-free nature. It is one of the classic trees used in Japan for bonsai and so makes an excellent tree for that purpose. The leaves become very small when grown as a bonsai, creating a real ‘miniature tree’ look. 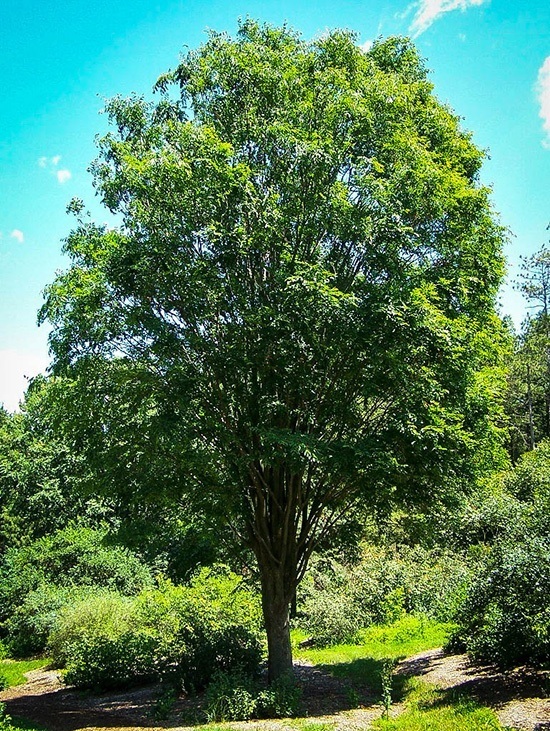 The Zelkova tree grows rapidly when young, quickly becoming an attractive small tree. Eventually it slows down to reach a mature height of around 70 or 80 feet. 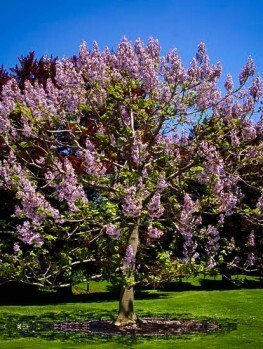 It has a strong trunk with branches rising up to make a broad crown which makes it an excellent choice as a shade tree. 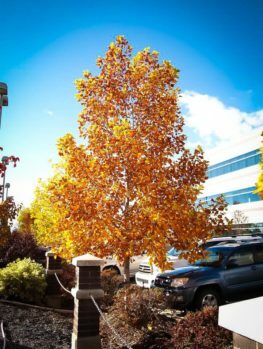 It produces very little debris so it is easy to clean up in the fall and it makes a gorgeous fall display of yellow, orange and red leaves. 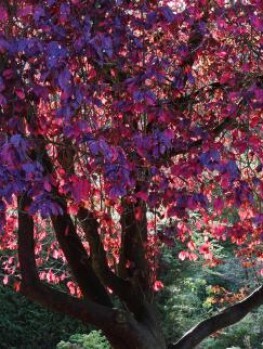 This is a tree with quiet majesty to give your garden a classic, mature and dignified appearance. It makes a beautiful shade tree or an avenue on a larger property. It can also be grown as a high-quality privacy screen and can be a classic choice for bonsai. 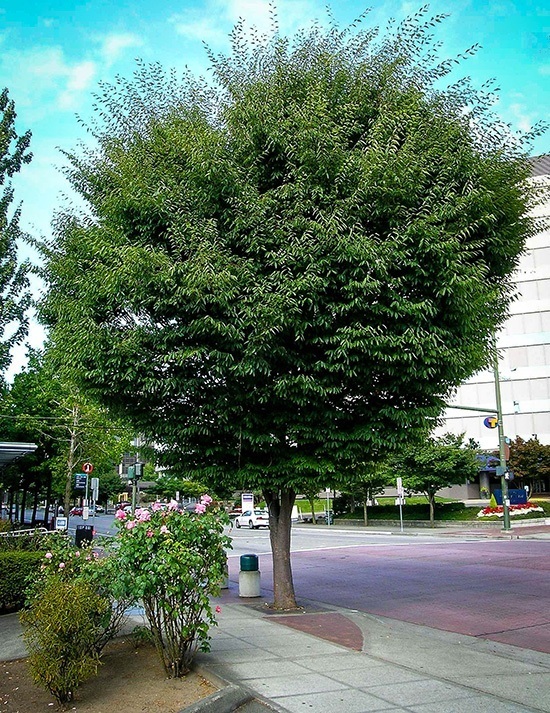 The Zelkova Tree is fast growing when young, increasing by one or two feet a year and perhaps even more with good soil, water and fertilizer. It is tolerant of urban conditions and once established it is drought tolerant too, so it will need little or no additional water unless growing in very sandy soil. It has no serious pests or diseases, does not drop branches and does not produce a lot of debris. The branches remain upright and do not droop as the tree matures, so clearance for vehicles and people does not become an issue with older trees. 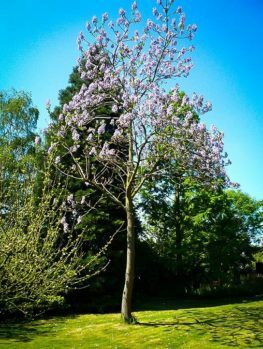 This tree has a stout trunk that can become 3 feet across but it does not have the shallow roots of many large trees so it will not lift driveways or sidewalks and can be safely planted within a few feet of a paved surface. The branches tend to rise from one point on the trunk, so that the tree has an ’upside-down broom’ appearance. 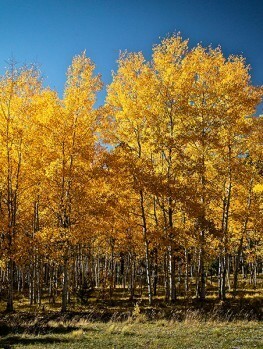 It will grow quit rapidly when young and reach 60 or 80 feet tall in time, with a spread of 50 or 60 feet. The bark is grey or soft orange when freshly exposed by the peeling of the outer layers. The effect is to give the tree a venerable, mature appearance. The leaves are about 2 inches long, with an oval shape and small, soft ‘teeth’ along the edges. They are a deep green and make a brilliant fall display, turning yellow, orange and red. The flowers that occur in spring are rarely noticed and the small fruits do not attract squirrels or make a mess when they fall. 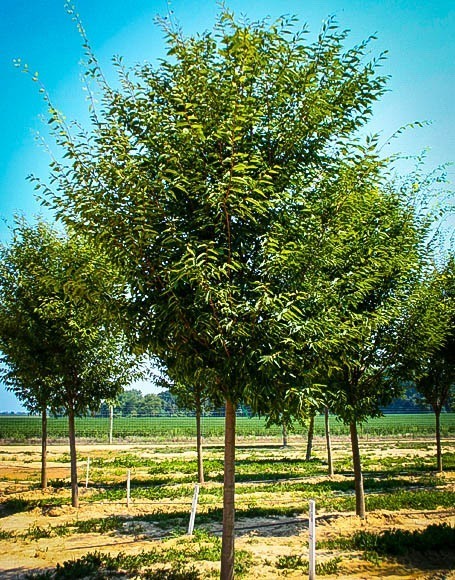 A Zelkova Tree will grow from the warmer parts of zone 5 all the way through zone 8, so outside of the warmest and coldest regions, this tree can be grown across most of America. 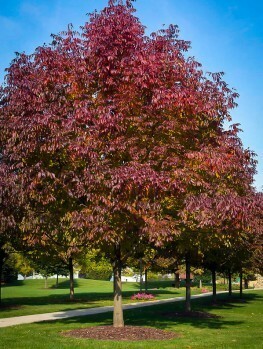 Although it prefers a deep, moist, loamy soil – like most trees – it will happily grow in poorer soil and particularly in alkaline soils where many other shade trees like maples and oaks do very poorly. It should be planted in a sunny location. Choose a sunny location to plant your tree and allow 30 feet clearance from buildings, property boundaries or power-lines. If you are planting a row, allow 20 to 30 feet between the trees. To plant your Zelkova Tree, dig a hole two to three times the diameter of the root ball and mix in some organic material such as compost, rotted manure, rotted leaves or peat-moss. Just make the hole the depth of the pot and break-up the bottom a little. Add some starter fertilizer (such as superphosphate) to get your tree off to a strong start. After you put back most of the soil, firm it well around the roots, water very thoroughly and after the water has drained away fill in with the remaining soil. It is best to gradually remove lower branches as your tree develops so you have a good clearance from the ground for the branches. 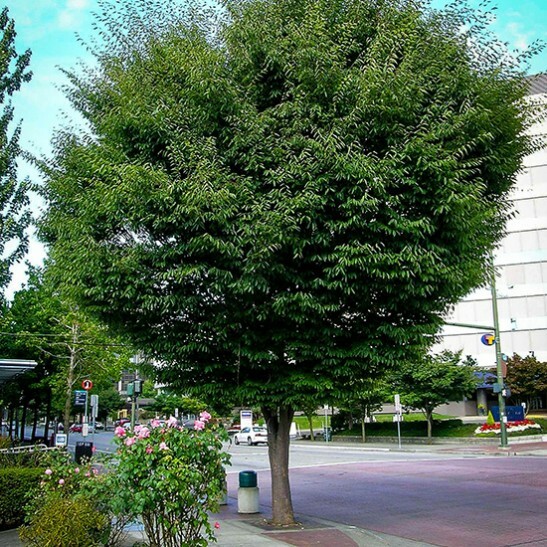 Zelkova trees naturally have most of their main branches growing from one point, but if possible try to spread them out a little and keep a central stem growing taller, as this will make the tree sturdier and more storm-resistant. A Zelkova Tree is a special plant and only the exact plant will have the proper shape, disease resistance and fall color. It must be produced directly from trees absolutely known to be right. Our trees are grown by grafting stems from selected trees with the best qualities onto the roots of seedling trees. That way every tree is identical to the original so they will produce a very uniform effect when planted in a row. However these take longer to produce, so avoid cheaper, seedling trees that will only be a disappointment.